A reliable, effective drum blaster without frills. 15 Shot Pump Action drum blaster with Slam Fire mode: An ideal Battle Blaster! 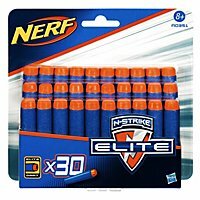 To appreciate the Nerf N-Strike Elite SurgeFire, you might have to look twice. On closer inspection, however, you quickly realize that the SurgeFire can be a very effective battle blaster. Large capacity thanks to 15-dart drum, easy operation thanks to pump action grip and fast shot rates with the proven Slam Fire mechanism. Especially Nerf fans, who are reluctant to burden themselves with spare magazines, get their money's worth here. 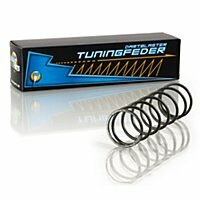 Front loaded drum blasters have the great advantage that they can be quickly reloaded with darts even in the hustle and bustle of a battle. Players with magazine blasters quickly get problems if they have no preloaded spare magazines. Anyone who has ever tried to reload a magazine under a hail of foam will know the problem. A drum blaster like the SurgeFire, on the other hand, can be quickly reloaded with darts lying around thanks to the easily accessible drum. 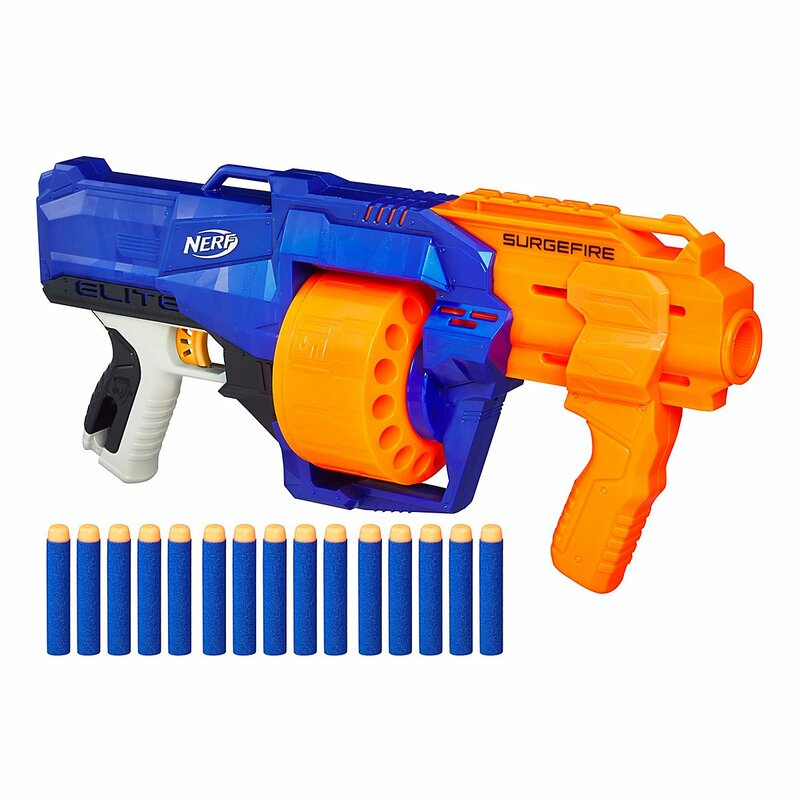 With a capacity of 15 darts, it is also in no way inferior to a magazine blaster. Like all blasters with a pump grip, the SurgeFire has a very pleasant handling. The rapid fire mechanism (keeping the trigger pulled pushing the pump grip back and forth) provides rates of fire that can easily compete with full auto blasters. Particularly positive about the SurgeFire is that all these advantages (large drum, pump handle, slam fire) are contained in a housing which has been designed as compact as possible. The result is a very effective, maneuverable foam flinging device, which is extremely good for indoor battles. In addition to the accessory rail, the three sensibly placed eyelets catch the eye. This allows straps and bandoliers to be attached in different ways. The first drum filling is included as usual - so 15 Nerf darts are included. Of course, the blaster can be laoded with all Nerf Elite-like darts of other series (like Zombie Strike or Modulus). 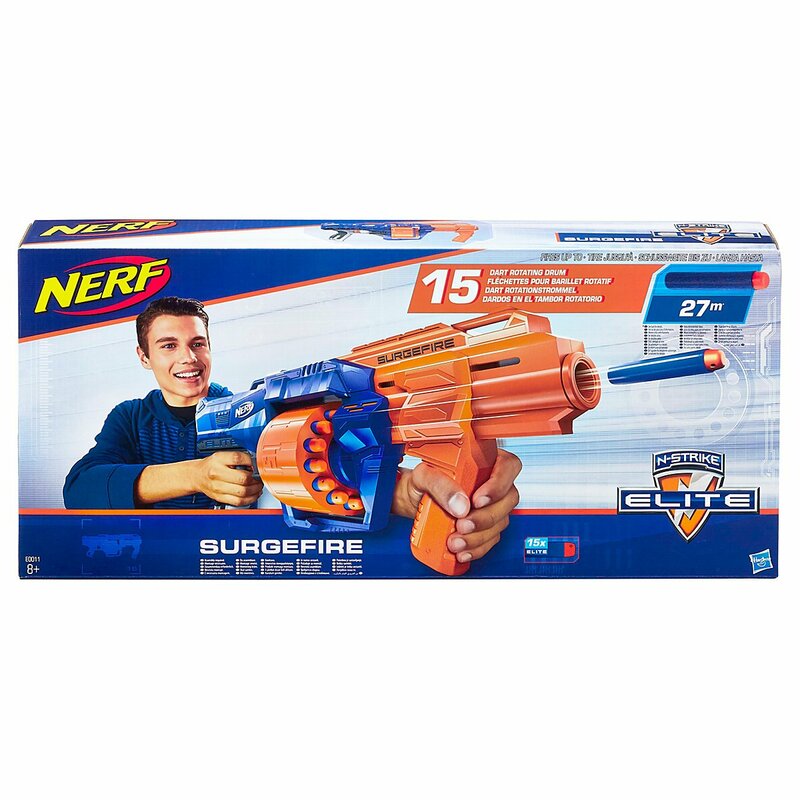 The SurgeFire is a must-have blaster for all fans of spring-powered blasters who do not like to carry replacement magazines with them.